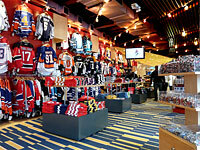 The street-level Spirit of Hockey retail store features HHOF-branded apparel. Click to enlarge. 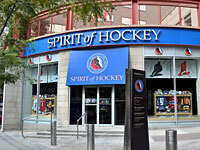 The exterior entrance of the Spirit of Hockey retail store - located at the corner of Yonge and Front Streets in downtown Toronto. 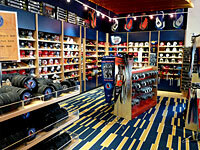 Spirit of Hockey retail store. 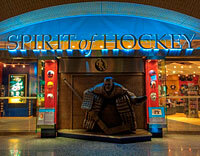 A sculpture honouring the "At The Crease" painting guards one of the two entrances of the Spirit of Hockey retail store. Click to enlarge. A display honouring the 2018 Hockey Hall of Fame Inductees Brodeur, Hefford, St. Louis, Yakushev, Bettman and O’Ree stands just outside the entrance to the Spirit of Hockey. Click to enlarge. 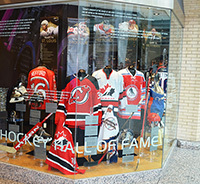 The street-level Spirit of Hockey is the official retail store of the Hockey Hall of Fame. Featuring exclusive HHOF gear, a large selection of fully-licensed NHL and Hockey Canada apparel and other hockey-related merchandise. One of the exciting design elements of the store is the larger-than-life sculpture based on Ken Danby's iconic "At The Crease" painting. 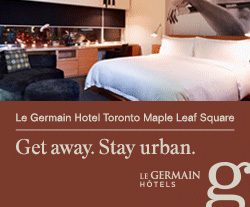 The sculpture is located at the store's interior entrance within Sam Pollack Square, Brookfield Place. The Spirit of Hockey retail store is open 362 days a year, with the exception of New Year's Day, Christmas Day and Induction Monday. 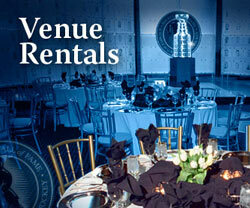 Click here for the Spirit of Hockey retail store hours of operation. Can't make it to the Spirit of Hockey today? 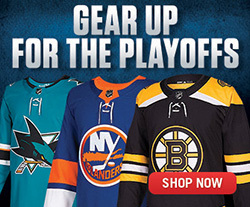 Click here to check out the Official Hockey Hall of Fame online store.